You guys, this is what summer should taste like. First of all, let’s talk about some things I love: fresh salsa, tomato sauce, pico de gallo, roasted tomatoes, gazpacho. I could eat all of those straight from a spoon. Things I literally can’t swallow even if someone offered me a cookie after (okay maybe if someone offered me a cookie after): adorable little cherry tomatoes, raw tomato slices. I know, it’s weird. I LOVE tomatoes in so many things, but I can’t chew a raw slice to save my life. Which brings me to Caprese salad. I love everything about it. Only I usually pick out the tomatoes (so yes, what I really like is mozzarella cheese salad.) Which brings me to this amazing twist on the classic Italian dish. 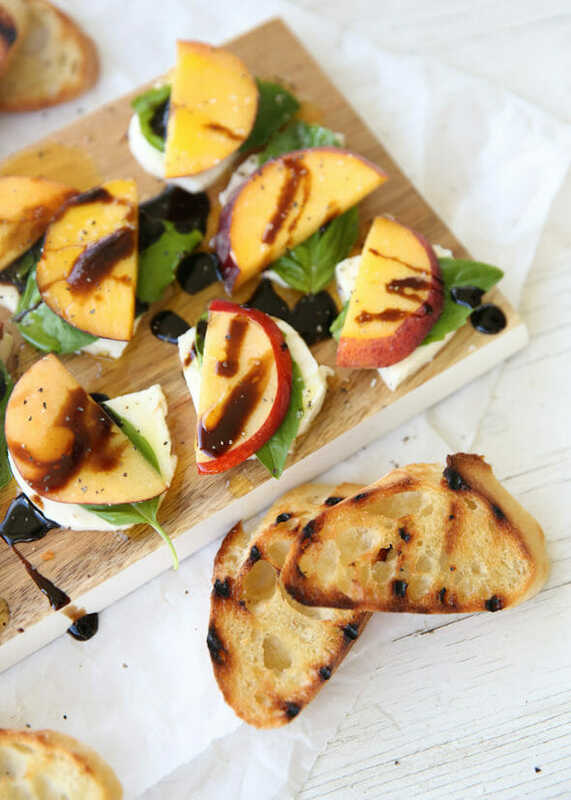 Fresh peaches that are juicy and sweet, are the perfect compliment to creamy mozzarella, sweet basil, and flavorful olive oil. A pomegranate balsamic drizzle takes these over the top. 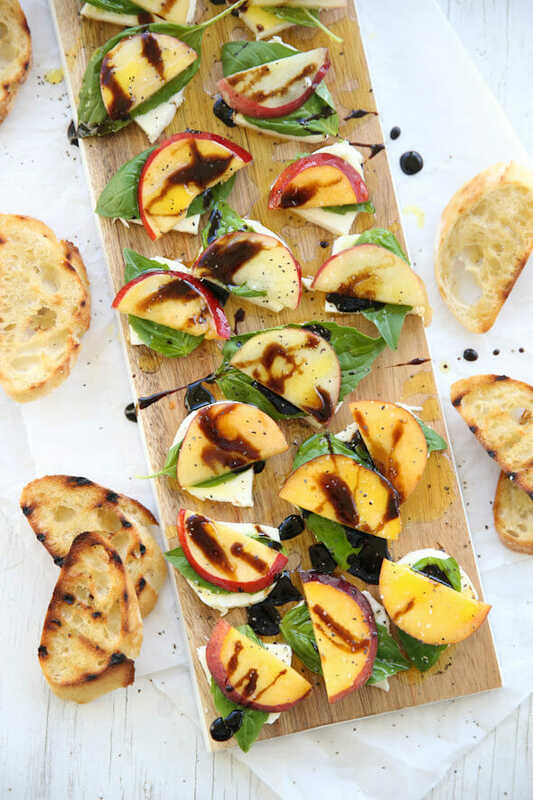 This is such a great summer appetizer. 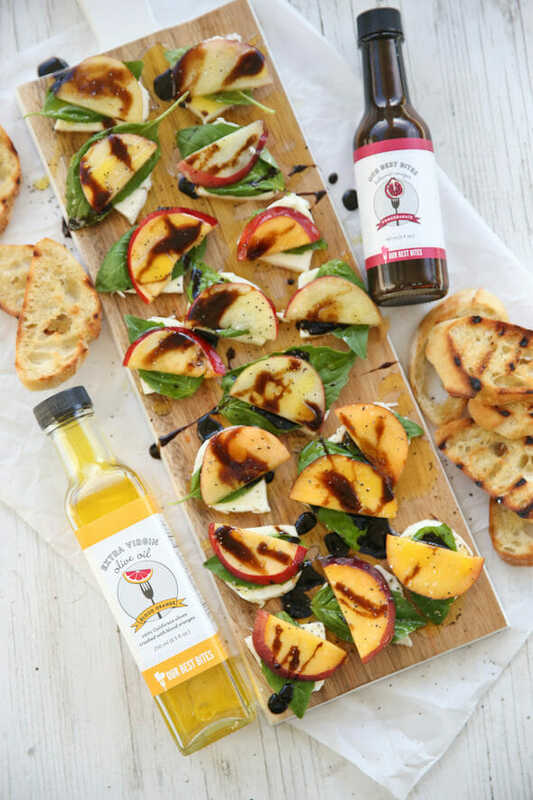 It’s a casual-yet-elegant thing to take to a party or potluck, or a great summer snack. I suggest making sure your peaches are nice and sweet. If they’re lacking in flavor, or on the tart side, it just doesn’t taste as great. 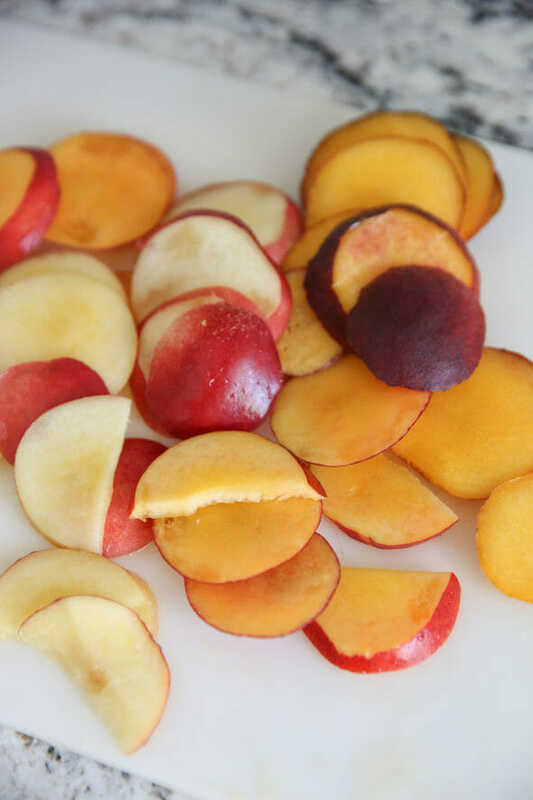 This works well with both white and yellow peaches, or even nectarines; I’ve got a whole mix here. I feel like the stacks make it easy to serve since you can just grab one little pile. Once they’re layered on your serving dish, drizzle with olive oil and balsamic vinegar and sprinkle with salt and pepper. My favorite way to serve these is with a lightly toasted crostini. I brushed these ones with garlic olive oil and tossed them on my grill, but you can do them in the oven as well. You could also turn this into bite-sized finger food by using the mozarella balls and threading onto little skewers. 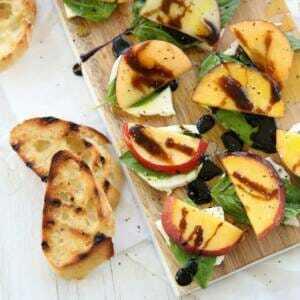 When I make them this way, I place mozzarella balls and peach chunks in a bowl and toss them all with olive oil, salt and pepper. If you’ve got time, you can do that part ahead and just let them marinate. 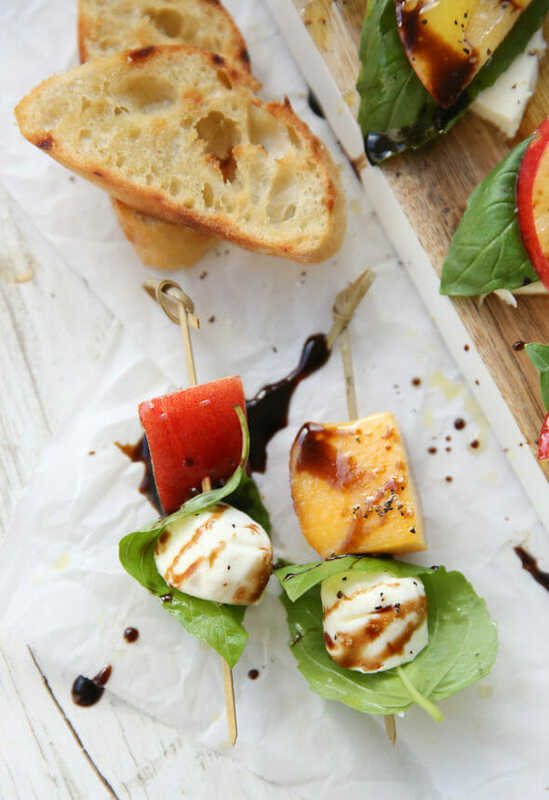 After they’re skewered I drizzle with balsamic. 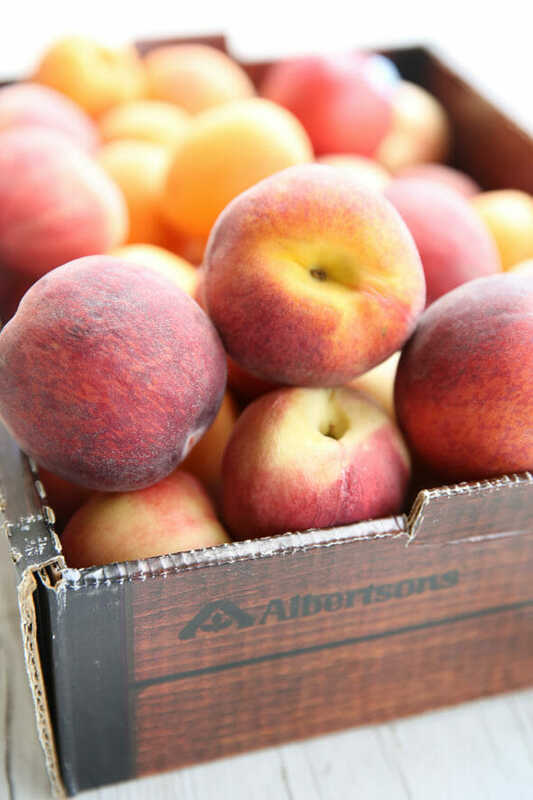 Either way you make them, you should definitely try this while peaches are in season! 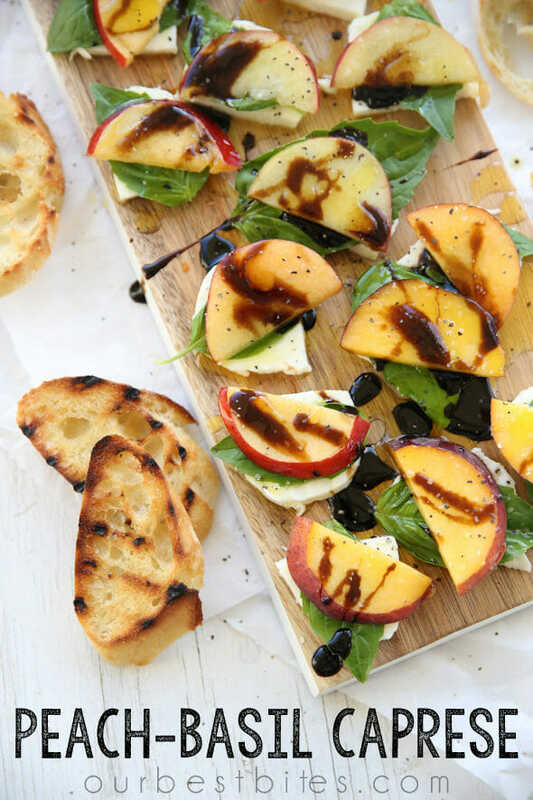 A delicious summer twist on the classic Italian Caprese salad, made with sweet fresh peaches. 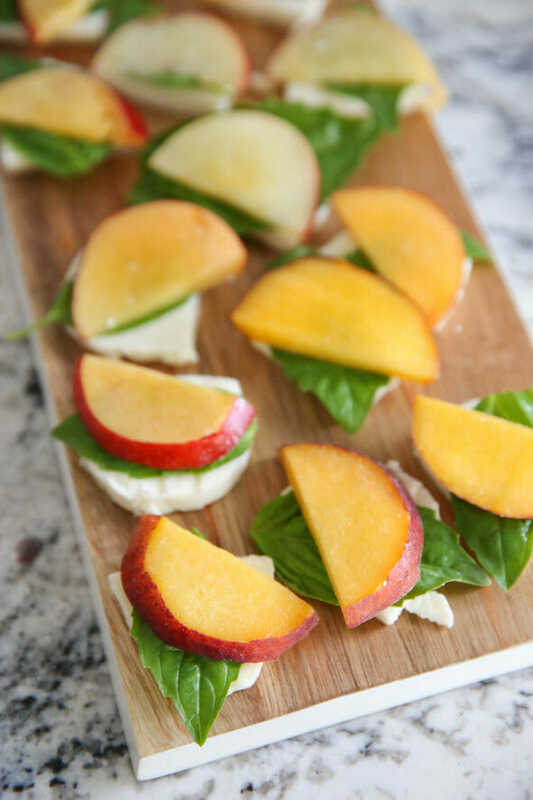 Layer peach slices with a slice of mozarella cheese and a basil leaf. 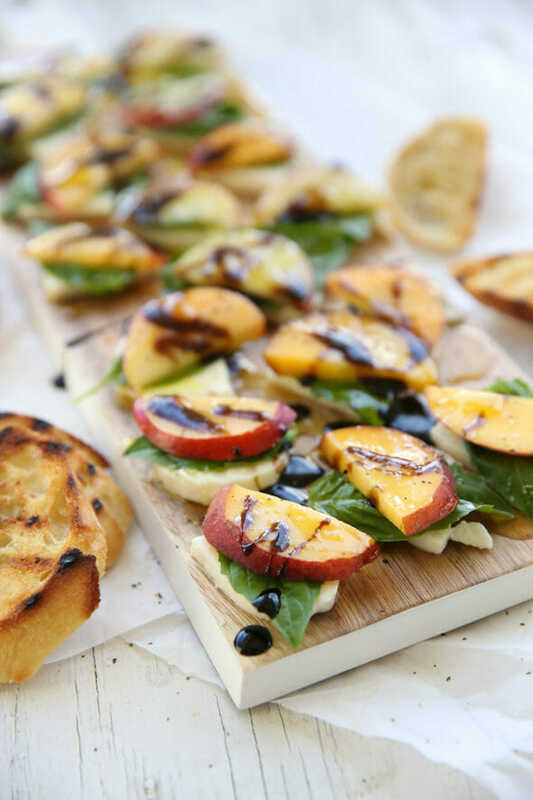 Drizzle stacks with olive oil and balsamic vinegar and sprinkle with salt and pepper. To serve on crostini, brush slices of baguette with olive oil and either grill or place in a 400 degree oven until lightly golden and toasted. We love to use garlic olive oil, or instead, cut a large clove of garlic in half and rub onto surface of bread before drizzling with oil and toasting. Ahhh, I absolutely love this! I sort of agree with you on the tomato part – I eat them raw, but not really happily. Love your recipes n the beautiful pics. Can u pls tell me if ur balsamic vinegar contains any hint if wine? Nope, no wine at all! We don’t drink alcohol for religious reasons, so it’s something we take seriously. 🙂 Have a great day! Made these for our July 4th spread, and they were so good! I’m a huge fan of traditional caprese salad, and was worried I’d be disappointed. Not at all — they just taste like summer! Totally making these again!! ❮ Previous Post Previous post: Father’s Day Sale!